A Visitor for The Children’s Book Review. Bianca: A Visitor for Bear is wonderful. How does it feel having your book so well received? Bonnie: Thank you! It feels great. This past year has been a dream come true. For a while there it felt like every time I turned around something wonderful was happening from great reviews to hearing it read on National Public Radio. Landing on the New York Times Bestseller list! Picked by Oprah. Amazon’s Picture Book of 2008! As they say, all glory is fleeting, so I’ve tried to just appreciate and enjoy it. Bianca: From where did you draw your inspiration? Bonnie: For “A Visitor for Bear” I was thinking about how certain things in life keep coming back. A type of person or problem or mistake. You turn around and there it is again! Stories take problems and insights and turn them into metaphors. I think writers’ minds, in particular, do that—leap from an idea to a metaphor and vice versa. So this abstract thought about things recurring in your life, suddenly took the form of a visitor who wouldn’t go away. Bianca: What made you pick a bear and a mouse for your main characters? Bonnie: At almost the same moment I thought of this persistent visitor idea, the mouse and bear characters popped into my head. Bianca: How long did it take you to write? Where did you do most of the writing? 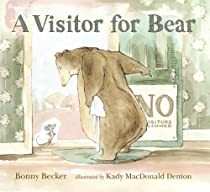 Bonnie: “A Visitor for Bear” is one of the fastest books I’ve written. Often it takes me years—even for a picture book. I’ll write the first draft, rewrite, get feedback. Get stumped and set it aside. Months later I’ll pull it out, go through the same process again. Get stumped and so on. Although I did a lot of rewriting with “A Visitor for Bear” the process only took about six months. I do almost all my writing on my computer at my home office. Bianca: The illustrations compliment the story beautifully. Did you pick Kady Macdonald Denton as the illustrator? Bonnie: Aren’t they wonderful! I was almost literally dancing for joy when I saw the initial sketches. Kady captured their personalities so perfectly. My editor at Candlewick, Sarah Ketchersid, and the art director there, picked the illustrator, as is typical. They are also the ones who chose to make the book 54 pages, much longer than a typical 32-page picture book. They did that to make the most of the comedic timing. There are very few publishers who would add that extra cost just to make the story work at its best. So I bow down to Candlewick! Bianca: Can you tell us a little bit about the next escapades of Bear And Mouse, A Birthday for Bear and A Bedtime for Bear? Bonnie: Oh, I’d love to! In “A Birthday for Bear” Bear is his fastidious, grumpy self on his birthday—even denying that it is his birthday. Mouse disguises himself as various deliverymen, etc. trying to get Bear to admit it’s his birthday and enjoy the day. In “A Bedtime for Bear”, Bear has Mouse over for Bear’s first ever sleep over. But in order to sleep, Bear does need quiet, absolute quiet. To Bear’s great frustration and growing annoyance, Mouse is not as quiet as a… well, you know. “Birthday” will be out this fall in the form of an early reader. “Bedtime” will come out in 2010 as a picture book and then will come out in an early reader format. Candlewick is interested in developing a picture book and an early reader line for these characters. Kady is illustrating the upcoming books and is doing another incredible job. Bianca: Who do you read your stories to before you submit them to your publisher? In other words … do you have any story-time guinea pigs? Bonnie: I definitely run everything by my critique groups—usually several times. But I don’t read my manuscripts to kids. The thing is you don’t get a true sense of your story because kids generally want to please you. They want to like this story. And the effect of the story is also colored by you being there, reading to them in person. Bianca: I read that as a child you wanted to be a writer, at what point did you consider yourself one? Bonnie: I began my writing life as a journalist and when I got hired at a weekly newspaper in my mid-twenties I felt like a “real” non-fiction writer. But my true goal was to write fiction and I don’t think I felt comfortable calling myself a writer in that sense until my first book was published in 1996. Bianca: What do you consider the most enjoyable part of being a writer? Bonnie: Wow, that’s a hard one. I love when I’m writing and just the right word comes or the story turns in just the right way. Those “aha” moments. I love my books getting attention. I love when I hear from a kid or a parent about how much they liked a book of mine. It’s incredible to see your books in the library and in bookstores and on the Internet. But, I guess it is the creativity part that’s the best. I mean, I’d still write even if my books went nowhere. Although maybe “enjoyable” wouldn’t be the right word for that! Bianca: On a personal note, did you really meet your husband in the vitamin aisle of a grocery store (nice work)? Like all good hosts should … I’d like to thank Bonny Becker for visiting with us, courtesy of Provato Marketing. To see who else Bonny is a visiting for a chat please check www.provatoevents.com. I’m so delighted to hear that there will be more books about Bear and Mouse! A Visitor for Bear has been a storytime hit at my library. Thanks for doing this sweet interview. You’re very welcome. I am very excited about the next Bear and Mouse books, too!! Are you the Bonnie I used to hang out with as a kid?